This apartment is extremely modern and well designed with a large open plan living room and kitchen area and one Master bedroom with double bed. There is also a unique ensuite bathroom with a large basin, shower and toilet. Every aspect of this apartment has been so well thought out and the decor is absolutely stunning. -High speed wifi throughout the apartment. For cancellations within 2 days prior to the arrival day we charge the 100% of the total amount. The apartment Ullmann is located in Chueca area. The apartment is located in the vibrant Chueca district, near the square that lends its name to the district, the heart of Madrid's modernity. Having been a poor part of town, today Chueca experiences its rebirth, becoming the gay center of Madrid and the epicenter of a vibrant outdoor nightlife. Many shops and trendy bars have recently opened here. The area is very liberal, colorful, lively, in contrast with the architecture of the XIX century with its buildings and pedestrian streets. The heart of the district is the square from where it takes its name, Plaza de Chueca. Plaza Mayor - 0.37 km. El Rastro - 0.50 km. Almudena Cathedral - 0.62 km. Extremely stylish studio apartment perfect for a couple with a child. 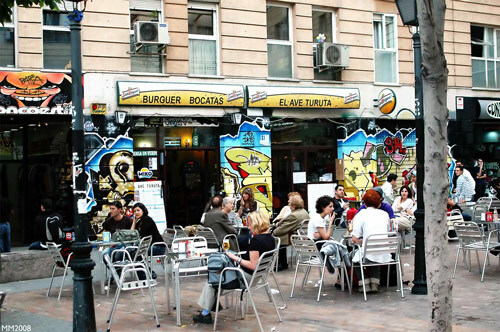 It is located in the colorful area of Chueca.